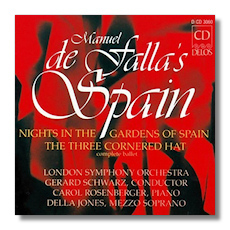 Manuel de Falla y Matheu (23 November 1876 - 14 November 1946) dominated Spanish music in the Twentieth Century. Arguably, the composers of Spain have yet to recover from his influence. Although Spanish folk music has attracted foreign composers at least since the Renaissance – Domenico Scarlatti, Nikolai Rimsky-Korsakov, Mikhail Glinka, Claude Debussy, and Maurice Ravel, to name just a few – it took a while for a native, nationalistic school to arise. Spanish composers for a long time followed mainly Italian models. This began to change with the composers Francisco Barbieri, Isaac Albéniz, who had studied in Leipzig, and Enrique Granados who had attended the Paris Conservatoire. The latter two were roughly ten years older than Falla and thus belong to a slightly earlier generation. Barbieri, a major creator of zarzuela (a uniquely Spanish form of operetta), enjoyed his first triumphs in the 1860s and died in 1894. Although he knew and admired the music of Wagner, his own compositions drew on folk elements and are spiced with modality. His success influenced the young. Albéniz and Granados, both virtuoso pianists, took a basic Chopin idiom and grafted a Spanish surface onto it. Falla's early music does the same. However, a higher degree of finish distinguishes Falla from his forerunners. 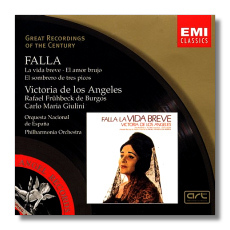 Nevertheless, Falla encountered setbacks as he tried to establish a career in music. He lost an important composing competition to Granados, and his six zarzuelas failed. Indeed, only one of them was even staged. However, his opera La vida breve (1905) won a competition, the prize of which was to have included a performance. Nevertheless, the opera remained unstaged for many years. Discouraged, Falla accepted an offer to tour France as an accompanist. He wound up living in Paris for the next seven years. Paris proved decisive to Falla's artistic growth. He met, and became friendly with, such important figures as Diaghilev, Dukas, Debussy, Ravel, and Stravinsky. He began to absorb Impressionism into his music, following mainly the examples of Debussy's and Ravel's musical postcards of Spain, and this results in Falla's major score Noches en los jardines de España for piano and orchestra (1909-1915). The outbreak of World War I forced Falla back to Spain. There he became involved with the Teatro de Arte and met his future collaborators Maria Lejárraga, wife of the company's founder, and the poet Federico García Lorca. 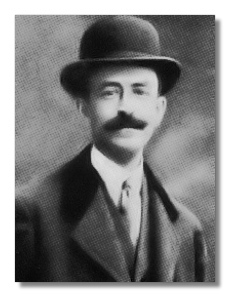 Lejárraga provided the librettos for the gitanería ("gypsy revel") El amor brujo (1915) and the ballet El corregidor y la molinera (El sombrero de tres picos, 1917), both of which show the influence of the early Stravinsky ballets. Both works incurred adverse criticism within Spain for their corruption of music by "foreign influences," even though Spanish composers had adopted foreign sources for centuries. Diaghilev took up El sombrero and mounted it in London with tremendous success. It marks the beginning of Falla's international reputation. Times change. These works are now held up as quintessentially Spanish. We see in Falla's work at this time an impulse to create Spanish Modernism, similar to what Juan Gris did for painting and Antoni Gaudí for architecture. Stravinsky's handling of Russian folklore increasingly provided the model. Key works by Falla include the Fantasia baetica (1919), El Retablo de maese Pedro (1923), and the harpsichord concerto (1926). The overt "Spanishisms" almost disappear in these scores, and yet they paradoxically come across as intensely Spanish. It should be noted that Falla worked very slowly, subjecting his scores to severe self-criticism, starting major projects and abandoning them as unsatisfactory. Atlántida, the oratorio which occupied him until his death, he began in the mid-Twenties. However, each score that survived the ax is gorgeously wrought and almost always a milestone of Modern music. Noches en los jardines de España "Nights in the Gardens of Spain"